The Huawei Mate 20 family is going to be unveiled on October 16 and reportedly consist of three devices – the Mate 20, Mate 20 Pro, and the mysterious Mate 20X. The latter is the biggest of the bunch, sporting a massive 7.2-inch OLED display, and was previously rumored to be called the Mate 20 Porsche design. The 20X is also said to come with a huge battery, possibly 5,000 mAh, and it could also be Huawei's first smartphone with stylus support. Two newly leaked images of the Huawei Mate 20X show the phone sitting next to a rather bulky pen stylus. 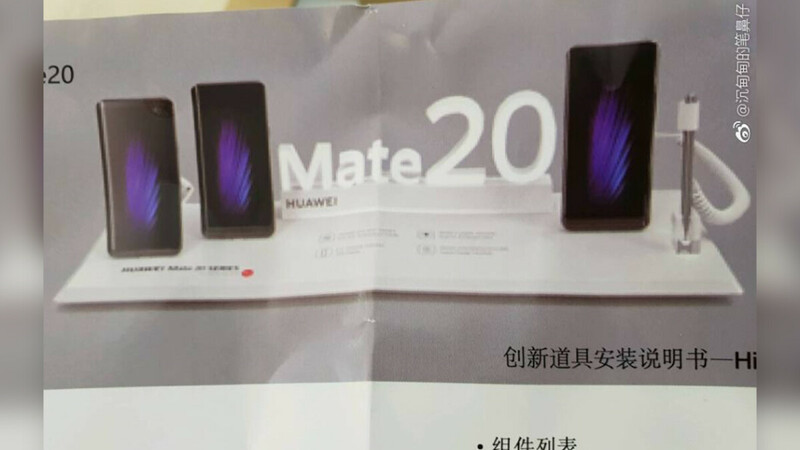 One of the images, posted on Twitter by Huawei Club, is of a flyer (pictured above) depicting three phones with the words "Mate 20" written between the devices. The two phones on the left are likely the Mate 20 and Mate 20 Pro, while the bigger device on the right should be the Mate 20 X. The positioning of the stylus next to the 20X may suggest that it's going to be the only phone with pen support, though we can't say for sure at this point. The way the stylus is depicted next to the phone, nested in its own stand, and going by the size of it alone, the chances of it fitting inside the Mate 20X — Galaxy Note-style — are slim to none. What's more, the stylus may not even come with the phone but be a separate purchase. Does this mean that the other two Mate 20 models will also have pen support? Too early to say. The Huawei Mate 20, Mate 20 Pro, and Mate 20X are scheduled to see daylight in London on October 16, although actual sales will probably kick off a little further down the line. The Mate 20 is rumored to start at a bit over $800, while the Mate 20 Pro may sell for over a $1000. No word yet on the pricing of the Mate 20X. Mate 20X with pen support!! Wow that's a surprise!!! They could make stylus like Samsung note series! Nice, stylus and big battery wow R.I.P Note 9. Stylus is an extra carry item on the mate it seems. I won't be getting rid of the note 9 just yet. Another threat to Note 9. Time for Sammy to reduced their Notes to $699. :D good joke! Samsung will increase the price more!